The TRACKER® TOPPER™ 1036 jon boat is easy to transport on top of a car or in a truck bed—and it can still fish 2 people! It also features a wide, 36" bottom for added stability. 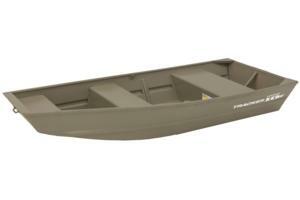 Crafted from a rugged 5052 aluminum alloy, this compact aluminum boat is backed by a 3-year riveted structural limited warranty, ensuring the quality TRACKER is known for.